At DR Main Floors, we value the importance of creating spaces that are both functional and aesthetically pleasing. This is particularly important in a school setting as the learning environment contributes to productivity. Recently, we were engaged by Ambrose Treacy College to help create a beautiful polished hallway in the hall at the rear of the main office building. Ambrose Treacy College is a unique school which caters for lively boys who are intellectually curious, creative and keen to learn. 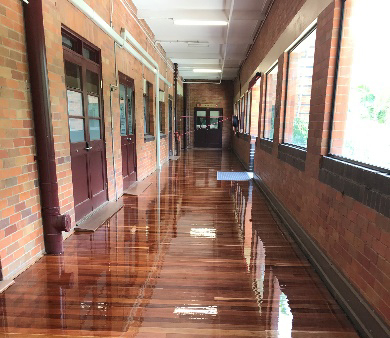 Being a local school we were honoured to be asked to re sand and polish this main busy hallway for the school. and deliver a result that was robust. The floors were finished with a Gloss Polyurethane Polish finish, which brought out the beauty of the natural wooden floors. Preserving history and culture within the college community is important. Originally, in 2014, the Boarding facilities in the Edmund Rice building were renovated into modern classrooms for their middle School students. The College prides itself on having well maintained facilities and we are so pleased to be of service to a local well regarded College.